Weight: maintained between 114 and 129 lbs. In the early 40's Rita had a pet doberman. Later, she and Orson Welles had a pet cocker spaniel named Pookles. 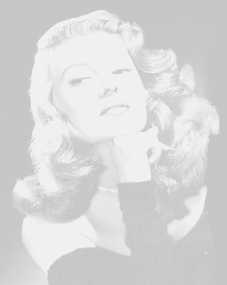 It has been said in books and other publications that Ginger Rogers was Rita's cousin. They were NOT blood relatives. Their connection is as follows: Rita's mother's brother, Vinton Hayworth, (Rita's uncle) was married to Ginger's mother's sister, Jean Owens (Ginger's aunt). Charles Vidor was Rita's favorite director. He guided her through The Lady in Question, Cover Girl, Gilda, and The Loves of Carmen. Rita never sang in her films (including Gilda, as some publications say), but she did sing her own songs in her later television performances, such as when she appeared on The Carol Burnett Show. Rita liked to collect perfumes. Robert Coburn was Rita's favorite studio photographer. He shot some of the most famous pictures taken of her, including the one used as the background for this page. On July 24, 1942, Rita and four other stars of Tales of Manhattan all put their individual hand and foot imprints in the forecourt of Grauman's Chinese Theater. To this day, Rita, Henry Fonda, Charles Laughton, Charles Boyer and Edward G. Robinson hold the record for the most number of squares imprinted on the same day. The yacht used in the film The Lady from Shanghai was actually legndary actor, Errol Flynn's yacht, the "Zaca". One of Rita's favorite hobbies was learning to bullfight. Blood and Sand was her first Technicolor film. You Were Never Lovelier and You'll Never Get Rich are said have been Rita's favorite of her own movies! She was also known to have been proud of Blood and Sand and The Loves of Carmen. Rita's first ten movies were made under the name of "Rita Cansino". If you've read this page, you'll do well in my Rita Quiz, and the somewhat harder, Quiz #2.